From now to freeze up there will be garage sales but the season really kicks off with the churches and their large spring rummage sales. Each year Ensign has brought you pictures of this premier sale with an attempt to highlight some of the interesting items that show up. 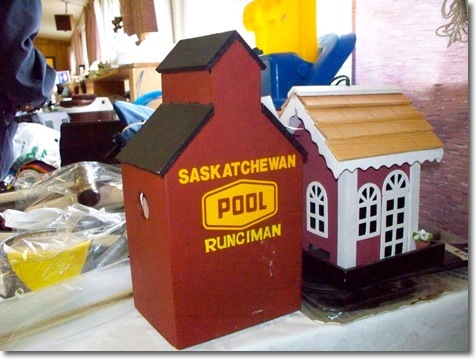 St. Matthew's Anglican Church spring rummage sale goes today, Friday and until noon on Saturday. They have more than enough stock in this sale for everyone to find some special item or useful goods on all three days as they actually hold back stock that is put out as the sales deplete the shelves each day. We were there just before ten today and the early rush had already come and headed off to other sales but there were still a lot of people working through the tables and tables of goods. This year's sale started outside with hot house starter plants at the front door and the bargains just were endless. The pictures are taken in sequence so that gives you a quick over view of what we saw this morning. Here are some of the highlights that really caught my eye. It really makes me scratch my head to figure out where items like these come from but right near the front door was a very small toaster oven designed only to be used with the cigarette lighter plug in a car. That nifty item was going for $1.00. A little further down I came across a really great coffee or hot liquid thermos type server. It looked much like ones I have seen used in restaurants and had to find my wife to see this $3.00 item. As we were looking it over a lady said to us. "I have one and it doesn't keep anything hot. I filled it with stones and use it as a door stop." Wisdom comes in all forms and we kept looking around. Click on the "pictures" to see some of this year's sale.